Let us know how we can better meet your needs! You may close your Setmore account/deactivate your account at any time. Before you close your account, make sure to backup your customer or staff data, as this information will become irretrievable. You can export previous appointment data using the Export Schedule feature, described in the support article here. Once you close your account, you'll receive an email confirming the action; this email will also provide a link to reactivate your account if you change your mind later on. You must first downgrade your account back to the free plan before you can close your account. This will ensure that you are not billed erroneously after closing your account. 1. 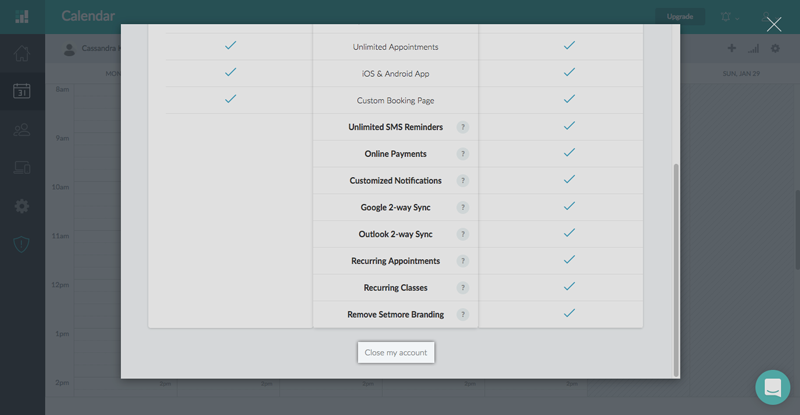 Click the Account icon in the top right corner and select Account Plan from the dropdown menu. 2. In the Account Plan menu, scroll all the way down to the very bottom and click the "Close my account" link. 3. You'll be prompted to provide a brief description of any issues or problems you encountered when using Setmore. Please fill this out as it helps us improve the app for other users! When finished, click the "Close My Account" button to make it official. 4. If the deactivation is successful, you'll see a confirmation message along with a brief farewell. We'll miss you! Once you close your account, you'll receive an email that confirms the action and includes a link to reactivate your account. Search your inbox for the phrase "Your Account Deactivated" to find the email, then click the "Reactivate" button.